Bring your children, grandchildren, neighbors or friends to Messiah on Saturday, December 2 from 9:00 until 11:00 AM. 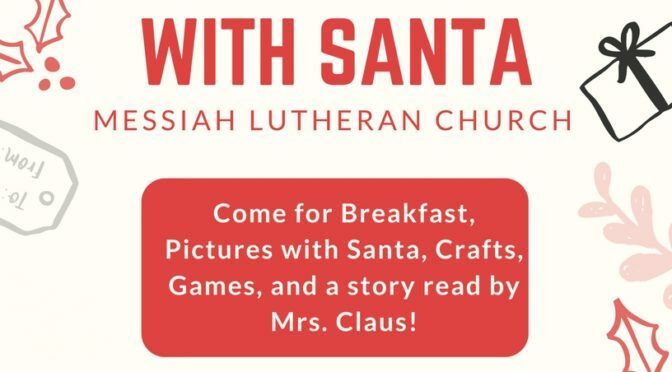 Breakfast will be served throughout the morning, Christmas crafts can be made by children, Mrs. Claus will share a story with everyone and best of all Santa in his big red chair will be here to hear your child’s wishes and give opportunity for pictures to be taken. We will have a complimentary picture too, from a professional photographer given to everyone. Come, enjoy the fun of Christmas in a child’s eyes.